This is post #2 recapping fall trips in Colorado. See the first post here. Second stop, the San Juan Mountains of Southwest Colorado. We basecamped out of Ridgway (at the State Park), which gave us great access to Ouray and Silverton in one direction, Telluride in another, and Owl Creek Pass in yet another. 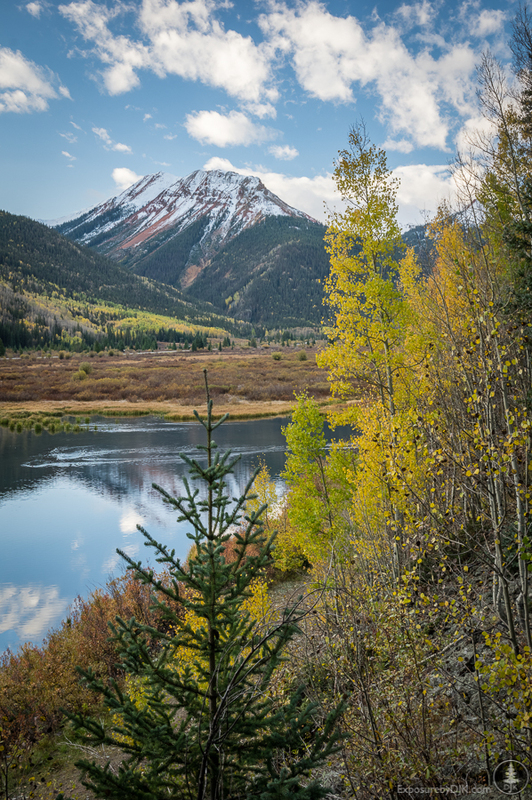 Hwy 62 & 145 to Telluride and beyond to roughly Ophir, as well as Last Dollar Road that cuts the corner of 62 and 145. There are many other side dirt roads that we explored, but I’ll have to save those for another post. For this post, I’ll just talk about the most popular areas. One challenge with this area is that it is popular in the fall. 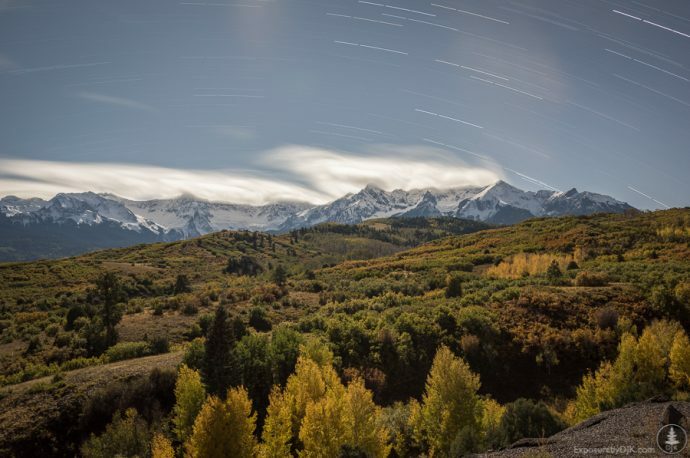 At popular destinations like the Dallas Divide overlook, you could be standing with 40 other photographers at sunrise. Still, they’re popular for a reason, so I go at least once to check it out. One strategy to avoid the crowds is to go at night. Above, I was in the same spot that had 50+ photographers that morning, but that night it was just myself and one other photographer. The above image is a stacked image of three photographs taken at 10 minutes each. Another popular spot is Crystal Lake off Hwy 550, just south of Ouray on the Million Dollar Highway. Again, a line of photographers can greet you (and I was there on a Friday). We took a few shots, then walked around the lake a little, then up the hillside. Not a single photographer was there. Finally, the Durango Silverton Railroad. It once carried valuable minerals out of the mountains, now it carries modern day gold – tourists – into the mountains. We set up just outside of Silverton and waited based on the schedule. And then waited some more. Apparently it was running quite late that day. In that time, it went from sunny, to rainy, to windy, to sort of sunny again. Finally, we saw the smoke rising up out of the valley and shortly thereafter the train came steaming out as well. 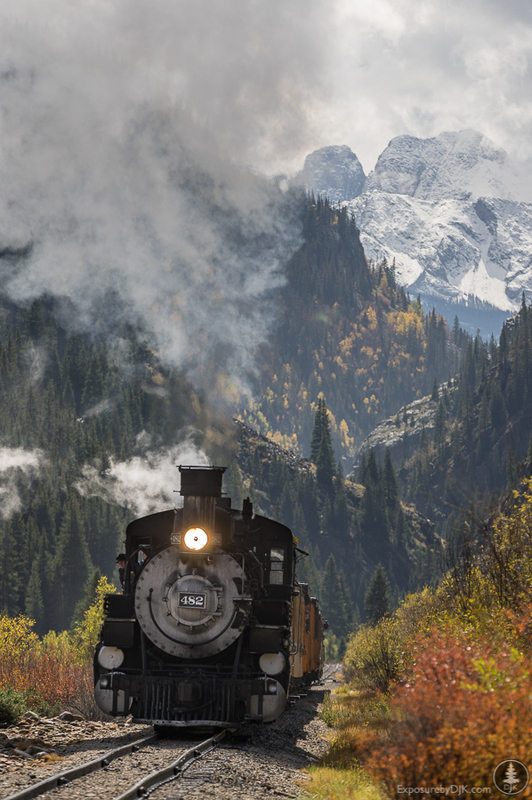 I shot this with a narrow focal length (200mm) to help compress the scene of the train and mountains. In short, zig when others zag. Sure, check out the typical spots, but don’t let your tripod get glued down to that one spot. After capturing a few of the classic shots, walk around, try other compositions, or come back at a different time to capture what others aren’t. This was also trip #2 of my 40 by 40 challenge.